This summer, the Jordanian Ministry of Labour announced that it had issued more than 106,000 work permits for Syrian refugees. With this milestone, the government crossed the halfway point to the 200,000 work permits it had committed to distribute as part of the Jordan Compact, a novel agreement that rewarded Jordan with international economic support and trade benefits in exchange for creating a pathway to legal work for Syrian refugees. Many sectors and roles remain off-limits, but since the signing of the Compact in 2016, Syrian refugees in Jordan have had access to formal employment in fields such as manufacturing, agriculture and hospitality. To engage refugees, a small set of civil society organizations stepped in, including Education for Employment – Jordan, an EFE Network Affiliate with a decade of experience training unemployed Jordanian youth and placing them into jobs. With the change in regulations, EFE-Jordan began offering training and job placement to Syrian refugees such as Zain Al Abdeen Alfadel, a young woman who fled to Jordan with her two children in 2011 amid the Syrian war’s intensifying violence. EFE-Jordan’s distinctive experience as one of the few organizations training Syrians and placing them into employment suggests five lessons for improving the efficacy of programmes aimed at increasing refugee participation in Jordan’s formal labour market. These complement existing policy reviews of the Jordan Compact and suggest ways to improve outcomes for the 655,000 Syrian refugees in Jordan, approximately 80% of whom, according to UN data, still live in poverty. For young people across the Middle East and North Africa (MENA) to deliver on their potential and catalyze economic growth, they need to learn the skills that align with private sector demands. This insight, which has driven the success of the EFE model in eight countries across MENA, is particularly relevant in Jordan. Market assessments, deep familiarity with government policy and labour law, and local relationships with employers are vital to ensuring that training results in a tangible economic opportunity for refugee youth. Likewise, it is crucial that programmes track outcomes that matter: metrics on programme graduation rates and the number of work permits issued are more meaningful when paired with insights on the real-world impact for beneficiaries, including job placement rates, retention rates and income insights. Engaging employers as thought-partners in structuring programmes is important, as formally employing Syrian refugees can be both attractive and complex. Formally employed refugees often command lower salaries than their Jordanian counterparts, and they can be perceived as more retainable, given that they have fewer employment alternatives. But some employers also say the potential for conflict between Jordanian and Syrian employees, and resentments over a perception of supposed Syrian “entitlement”, can impact their willingness to hire refugees. Listening carefully to these concerns and adjusting programmes in response is an important step in helping employers find real value in employing refugees in the long-term. Likewise, perceived cultural characteristics can be leveraged for positive employment or business outcomes. For example, EFE-Jordan’s experience with training and placing refugees in food services roles has shown that some employers believe the Syrian passion for cooking gives them a strong base for acquiring more complex, high-value culinary skills. The majority of Syrian refugees in Jordan live not in camps but in host communities in northern governorates such as Mafraq and Irbid. Even before the Syrian crisis, these governorates suffered from inadequate housing, infrastructure, and medical care, and experienced disproportionately high unemployment rates. The influx of refugees strained already limited resources and threatened social cohesion between Jordanian host communities and refugees.For equitable and meaningful outcomes, it is vital to ensure that programmes aimed at creating economic opportunities for Syrian refugees also drive employment in host communities. For example, this programme – implemented by EFE-Jordan with funding from the German development agency GIZ – empowered both Syrian refugee women and their Jordanian counterparts with skills in garment manufacturing, and with connections to tangible job opportunities for both when they graduated. Offering economic opportunities for unemployed Jordanians in host communities, and attracting them to growth sectors, such as hospitality, they might previously have avoided, does more than create near-term benefits. It also helps to create a talent pool that can continue powering the expansion of these sectors in Jordan when Syrian refugees eventually repatriate. 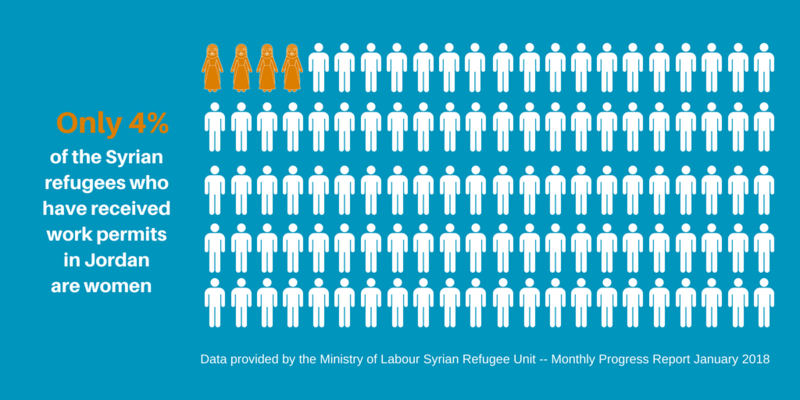 According to the Jordanian Ministry of Labour, as of 31 January 2018, women comprised only 4% of Syrian refugee work permit recipients. This starkly low number reflects a range of factors, among them the reality that many of the occupations opened to refugees are traditionally male-dominated, while cultural expectations and family commitments often discourage Syrian women from seeking formal employment outside the home. Meanwhile, there is a lack of adequate transportation and childcare options, which limits female refugees’ engagement in the formal workforce. Self-employment programmes showed excellent early results in supporting women Syrian refugees towards securing economic stability. A programme from the EU, the international Catholic NGO Caritas and EFE-Jordan, for example, have enabled women such as Siham Qasem to use the cooking skills she honed in Syria to launch a small business producing pickles, preserves and sweets in Jordan. But performing site visits to certify such businesses requires significant government capacity. Currently, home-based business permits are offered only to Syrians launching joint projects with Jordanians. Increasing the number of such permits, and preparing both Syrian refugees and Jordanian women to take advantage of them, could help to create greater gender equity in economic opportunity. Interventions that support refugees should help them access the skills and opportunities they need for sustainable livelihoods – on either side of the Syria-Jordan border. In order to help Syrian refugees easily transition into their home economy when the political situation allows, EFE-Jordan is exploring ways to engage stakeholders in performing labour-market assessments in Syria. These attempts seek to project the likely skills needs and employment opportunities that would emerge with stabilization in Syria. Such insights could be used as a basis to inform training programmes in Jordan that would meet Jordanian market needs in the near-term, and also enable refugees to integrate swiftly into the Syrian market in much-needed occupations that rebuild the country and spur economic growth upon their repatriation. Today, Zain, the EFE-Jordan trainee who fled Syria in 2011, has been hired as the chef’s assistant at Zaatar w Zait, a popular Jordanian restaurant chain. Noting Zain’s professionalism and persistence, the HR manager there assigned her a team of three, and she thrived. While her story is inspiring, it remains too rare. With nearly 100,000 work permits for Syrian refugees still pending, now is the time to put early learnings into practice. Doing so will make employment outcomes more equitable and long-lasting – both for the Syrian refugees themselves and for the Jordanian communities that host them.